SURGING energy demand needed to charge electric vehicles could overload the power grid, new research warns. The study by L. E. K. Consulting and Tritium, a leading electric vehicle charging infrastructure company, found electricity infrastructure had the potential to become overloaded in areas of high EV ownership. "If multiple houses on a single street decide to charge simultaneously, there may be insufficient capacity in the feeder lines," the report says. 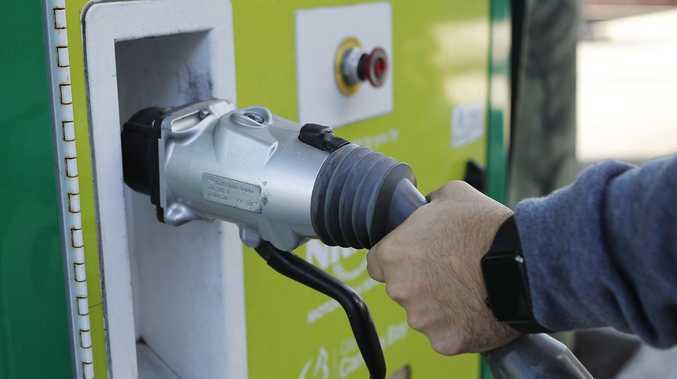 In the past year, the number of motorists driving EVs in Queensland has more than doubled, with more than 400 drivers in the southeast making the switch so far, State Government data this year shows. Analysis of sales data as part of this new research shows "clustering" of EV ownership in specific suburbs and streets. The report found households could use up to 50 per cent more electricity to charge EVs, and that most owners charged their cars at the end of the traditional workday. It warns that if utilities don't upgrade their infrastructure and EV charging goes unmanaged, peak demand could surge by up to 30 per cent once half the cars on the road are electric. L. E. K. Consulting principal Natasha Santha said EVs were one of the few growth drivers for many developed energy markets, which meant there would be significant opportunities for network owners, operators and energy retailers. "The real challenge for utilities is managing the peak demand increase and greater unpredictability that comes with greater EV adoption," Ms Santha said. "While EV uptake in Australia is still in its infancy, it is growing, and networks need to prepare for this now." Tritium chief executive and co-founder David Finn said utilities companies had a tremendous opportunity to drive growth in their businesses, however they had to be "prepared for it". "That means putting the right infrastructure in place to manage an increase in energy demand," he said. A Senate Select Committee that is looking at the use and manufacture of EVs in Australia is due to release its report by December 4.